During the 17th and 18th centuries, the Herero migrated to what is today Namibia from the east and established themselves as herdsmen. In the beginning of the 19th century, the Nama from South Africa, who already possessed some firearms, entered the land and were followed, in turn, by white merchants and German missionaries. At first, the Nama began displacing the Herero, leading to bitter warfare between the two groups which lasted the greater part of the 19th century. Later the two peoples entered into a period of cultural exchange. During the late 19th century, the first Europeans began entering to permanently settle the land. Primarily in Damaraland, German settlers acquired land from the Herero in order to establish farms. In 1883, the merchant Franz Adolf Eduard Lüderitz entered into a contract with the native elders. The exchange later became the basis of German colonial rule. The territory became a German colony under the name of German South-West Africa. Soon after, conflicts between the German colonists and the Herero herdsmen began. Controversies frequently arose because of disputes about access to land and water, but also the legal discrimination against the native population by the white immigrants. The Herero language (Otjiherero) is the main unifying link amongst the Herero peoples. It is a Bantu language, part of the Niger–Congo family. Within the Otjiherero umbrella, there are many dialects, including Oluthimba or Otjizemba- which is the most common dialect in Angola-, Otjihimba, and Otjikuvale. These differ mainly in phonology, and are mutually intelligible. Standard Herero is used in the Namibian media and is taught in schools throughout the country. The Herero have a bilateral descent system. A person traces their heritage through both their father's lineage, or oruzo (plural: otuzo), and their mother's lineage, or eanda (plural: omaanda). 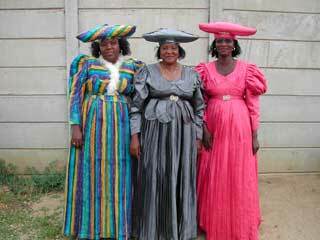 Despite sharing a language and pastoral traditions, the Herero are not a homogeneous people. The main Herero group in central Namibia (sometimes called Herero proper) was heavily influenced by Western culture during the colonial period, creating a whole new identity. The Herero proper and their southern counterparts the Mbanderu, for instance, wear garments similar to those worn by colonial Europeans. Traditional leather garments are worn by northwestern groups, such as the Himba, Kuvale, and Tjimba, who are also more conservative in other aspects. The Kaokoland Herero and those in Angola have remained isolated and are still pastoral nomads, practicing limited horticulture. Between 1893 and 1903, the Herero and Nama peoples land as well as their cattle were progressively making their way into the hands of the German colonists. The Herero and Nama resisted expropriation over the years, but they were unorganized and the Germans defeated them with ease. In 1903, the Herero people learnt that they were to be placed in reservations, leaving more room for colonists to own land and prosper. In 1904, the Herero and Nama began a great rebellion that lasted until 1907, ending with the utter destruction of the Herero people. It has been determined by experts that roughly 80,000 Herero lived in German South-West Africa at the beginning of Germany’s colonial rule over the area, while after their revolt was defeated, they numbered approximately 15,000. In a period of four years approximately 65,000 Herero people perished. Samuel Maharero, the Supreme Chief of the Herero, led his people in a great uprising on January 12, 1904 against the Germans. The Herero, surprising the Germans with their uprising, had initial success. German General von Trotha took over as leader in May 1904. In August 1904, he devised a plan to annihilate the Herero nation. The plan was to surround the area where the Herero were, leaving but one route for them to escape, into the desert. The Herero battled the Germans, and the losses were minor. It was when they had escaped through the only passage made available by the Germans, and had been chased away from the last watering hole into complete desertion, that casualties grew to insufferable amounts. At the 100th anniversary of the massacre, German Minister for Economic Development and Cooperation Heidemarie Wieczorek-Zeul commemorated the dead on site and apologized for the crimes on behalf of all Germans.